No till gardening really should be called no till farming, because it is referring to the elimination of conventional farming ways of plowing, compacting, degrading and eroding farmland, market gardens and sometimes community gardens by the use of machines. Some home gardeners have big plots of land or grow vegetables in a small commercial way, in which case the following information will prove invaluable. And just a mention for first timers into no till gardening. If your land has not yet built up a good layer of compost with all the necessary soil activity, then it may be necessary to aerate the soil yourself. Plants need sun, air and water to thrive, and if the earthworms aren't there yet, the soil will need to be broken up deep down for you to get a decent crop in the beginning. For a large plot of land, run a machine over it with prodder type spikes, and for a smaller plot, get yourself a long prodding garden fork and off you go. You don't want your plants to come to a full stop when their roots reach a hardpan layer. Don't turn the soil, just poke holes in it. It's no-till gardening, not no-poke-holes, so don't feel guilty because it's not as though you're turning the soil layers over or compacting the soil, (which is what conventional farming does). When no till farming first became popular, many farmers used chemicals or burning to get rid of their crop remains and weeds instead of plowing them under. Oops, that created more problems with chemical run-off into lakes and streams, and poison residues. Was plowing still a better option? No... plowing or rotary hoeing is terrible for the land in the long term. There are many complex reasons, and you may like to read further information on this by soil experts. But for now here are a few simple points. Firstly tilling creates soil erosion, because it breaks up the structure of the soil and fine particles are then easily blown or washed away, or washed down into the porous gaps in the soil and over time this clogs up the soil. This can cause any one of the following depending on the clay and sand composition of the soil: Loss of soil; water-logging; too much aeration; compaction — made worse by heavy equipment; and formation of a hard topsoil pan which hinders seed germination and stops water infiltrating. Secondly, although tilling initially makes crops produce abundantly because of sudden aeration, this is often excessive and abnormal for the plant. In the meantime organic matter, bacteria, fungi, beetles and earthworms are all destroyed by tillage and not able to maintain the fine balance of harmony by providing nutrients to plants in a timely cycle. Eventually more and more fertilisers must be used to maintain production. No till gardening is natural and the soil ecology is NOT sent topsy-turvy. Tilling damages and exposes earthworms and fatally buries other beneficial organisms including some that would normally help control invaders — such as plant-eating nematodes. Tilling releases CO² into the air, whereas if there was a rich organic soil layer, this carbon would be in the plant remains and thus retained in the soil. 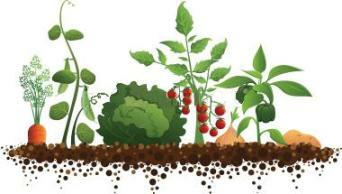 You can read more about how no till gardening sequests CO². Not only that, but the reduced use of heavy farm machinery with the no till gardening method, decreases emissions of CO². What farmers, market gardeners and small plot owners are doing now is either total no till farming or "conservation tillage." This means leaving the ground and any cover undisturbed, but using, if necessary, less damaging machinery to open up enough of a furrow or hole and in many cases do the sowing or planting with the same run. 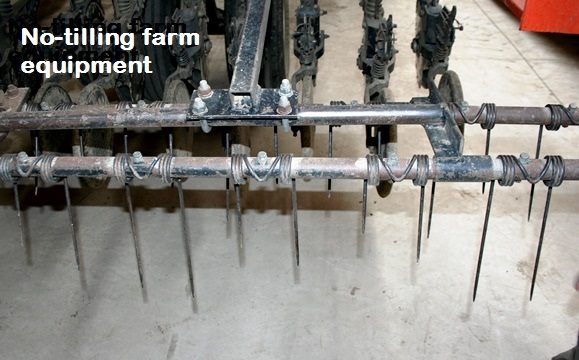 Some of the popular implements used are harrows, cultivators and chisel plows. 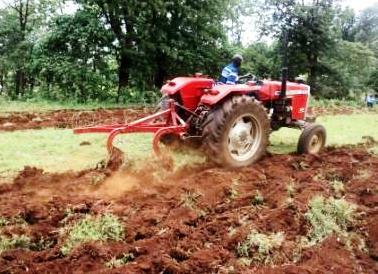 These land friendly machines only lift and moderately break the soil and prepare the surface for seed sowing or planting. In poorer countries of course, hand or oxen tillage is done by armies of farm workers. But for small scale gardeners anywhere, a fork and rake with occasional spade use for planting are adequate. 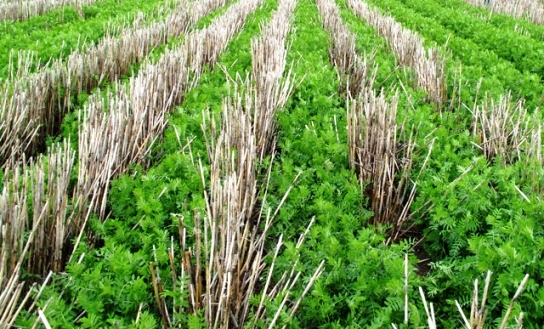 Sometimes a new crop is planted amongst the stubble of a previously harvested crop. These old storks or leaves are left to rot down and provide nutrients as well as suppress weeds. The longer no till farming is practised and the sooner compost is added or plant remains left to decompose in the field, the better the soil structure becomes. Over time, the yields have proven to be higher with this method. The golden rule with no till gardening is to avoid inverting the soil, and to tread lightly or not at all on your planting area.